2nd Edition. Updated January 2019. 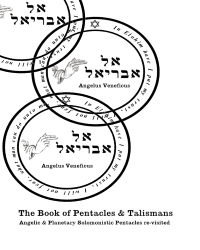 This is a unique publication, which explores the redrawing of the Solomonistic Pentacle, and corrects many errors in the origiinal drawings. Many ancient talismans feature sacred symbols today which include the four basic shapes pentagrams, hexagrams, squares and circles. Some include Hebrew letters, unintelligible letters or secret alphabets, these all align to a particular planets and therefore archangel. Amulets (Latin amulētum) on the other hand, differ from talismans, as a talisman is believed to bring luck or some other benefit, though it can offer protection as well. However, an amulet is an object whose most important characteristic is the power ascribed to it to protect its owner from danger or harm. Potential amulets can include gems, especially engraved gems, statues, and coins. I have had a life-long fascination with magical objects, talismans in particular. However, it did not take me long to understand that many of the Talismans, Pentacles, Seals and Amulets published in works of magick, and even some Grimoires, are from copies of copies of copies. These copies having been rewritten, retranslated, edited etc, repeatedly. So in my quest for enlightenment I decided to undertake a critically study of the most well-known talismans/pentacles contained in current popular occult literature, and attempt to identify those elements that were copied incorrectly, whether on purpose, to protect its true power or by an uneducated scribe who knew no better. Also using my occult experience of correspondences, to establish if the symbols etc. appear to be consistent with the entity or planet. I am not a graphics artist but have redrawn the images for a clearer picture, and present them so the images may be copied by you as accurately as possible. The format I have used gives the reader a number of reproduction alternatives, depending upon their mystical background and beliefs, all reproduced will a number of alternative versions i.e. in Hebrew, Latin and English. The choice of which version is really up to you. I have not updated any Pentacle of Solomon with the vesicle in Hebrew I have use Latin and English. During the update exercise for the Second Edition, I also reviewed the base pentacles for ‘The Key of Solomon (Clavicula Salomonis’), translated by SL MacGregor Mathers, and manuscripts Lansdowne MSS. 1203, as new planetary sigils have come into my possession. A “Miscellaneous” chapter has been added to include any identified pentacles that cannot be matched with any of the examined manuscripts, effectively they may be classed as “new” pentacles. Finally, this new addition has 63 new and revised pentacles from MS4670, and from MS4669, 17 new pentacles. IF YOU DONT RECEIVE A DOWNLOAD LINK - DO NOT WORRY - THIS eBOOK IS EXTREMELY LARGE 25 Megabyte AND YOUR INTERNET SUPPLIER PROBABLT RESTRICTS EMAIL SIZES OR DOWNLOAD RESTRICTIONS. SO TO SOLVE THE PROBLEM PLEASE INFORM US IMMEADIATELY AND WE WILL SUPPLY AN ALTERNATIVE DOWNLOAD METHOD. REMEMBER IF YOU DO NOT RECEIVE YOUR DOWNLOAD LINK WITHIN A REASONABLE TIME PERIOD LET US KNOW AND WE WILL EMAIL YOU (ENSURE YOUR EMAIL ADDRESS IS CORRECT) AN ALTERNATIVE LINK FOR THE DOWNLOAD.